The Enmore wooden coffey still is one of the most famous in the rumiverse, and is linked indelibly with Guyana and DDL. Somewhat subtler than the Port Mourant double wooden pot still and more elegant than the Versailles single wooden pot, rums deriving from it don’t always succeed – I believe it takes real skill to make a top-end 90-point rum from its output. But when it works well and is done well — as this one does and is — then it shines. It’s an unfortunate thing that DDL did such low key marketing for the Rares 2.0, because to my mind, the second release is better than the first, and this Enmore is the best of the lot. I’ve been harsh with DDL in the past, but just as I’ve given them hard card for fallin’ down ‘pon de wuk, praise for success must be equally prominent, since they deserve it here. And this a very good rum indeed. 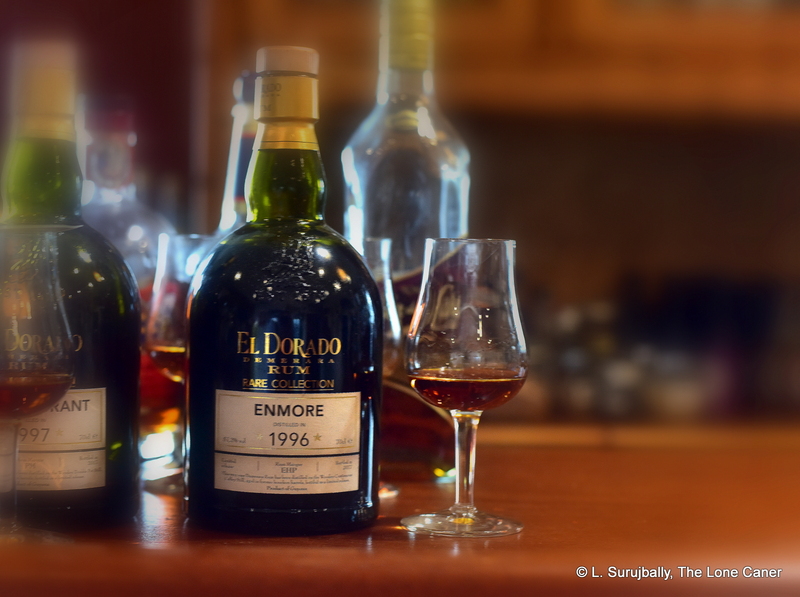 Distilled at a rough and ready 57.2% (a sniff less than the PM 1997 from last week), the Enmore Rare is a true 20 year old rum, aged in Guyana between 1996 and 2017, and each and every one of those years is on display for the discerning drinker. Consider first the nose — for that kind of strength, the aromas presented as almost gentle, and gave the PM that was tried alongside it a run for its money. They were not sharp and rough at all, rather, rich and pungent with pencil shavings and fresh sawdust, mixing things up with harsh coffee grounds, bitter chocolate, vanilla and a little nail polish. This was followed by a very rich blancmange and creme brulee, molasses, caramel, flowers and mint, in a sensuous amalgam of soft and sweet and crisp and musky, really well balanced off. I must admit I blinked a bit and then dived in again – it was unusual for me to detect quite that much in the first ten minutes, but yes, there they were, and I enjoyed them all. The rum also tasted remarkably well, suggesting a texture that eased across the tongue with both firmness and edge (not as easy to describe as to try), and at no point did it lose any of the qualities the nose advertised. The sawdust and sharper pencil shavings remained, and here the fruitiness emerged as a more dominant actor – cherries, raisins, fried sweet bananas, ripe apples, black grapes, and even some red olives (they’re not quite as salty as the green ones). Not content with that panoply, the Enmore proceeded to cough up creme brulee, light anise and molasses, flowers, coconut shavings and a sort of musky driness that reminded me of rain falling on parched ground, all ending up in a finish that was a neat high-wire act between the muskier and sharper flavours, without tumbling over the edge to either side – fruits, citrus, coconut shavings, coffee, caramel and vanilla, with a nice background of thyme. The entire experience was excellent. It lacked real full-proof force and fury while simultaneously being just the slightest bit untamed and edgy, and at all times giving a balanced series of delicious flavours with which I had little fault to find. Honesty compels me to admit that I wondered about additives, and while I have no idea whether it has been dosed or not (I was unable to test it), the overall profile muted any such concerns for me (while not eliminating them entirely – DDL has yet to earn my unquestioning trust; though for the record, the Rares have mostly been known as being unmessed with). As noted above, DDL’s consistent and continual lack of engagement with the rum blogosphere is as mystifying as the quiet release of the Rares 2.0. Aside from a small blurb here or there, I can’t remember seeing a serious blanket-all-the-channels press release from them, not for the Rares, not for the 2016 15 YO “finished” series, or for the 2018 12 YO series. About the only consistent thing is that all are seen as overpriced. And that’s a shame, because leaving aside the standard strength tipple which I don’t buy much of any more, the Enmore 1996 really is a damn’ fine dram. Yes it costs some stiff coin, but come on, it’s twenty years of tropical ageing with what must be a massive angel’s share and the result is simply superb. In my opinion, it’s the best of its kind DDL have made to date. Summing up, the Enmore, then, excites equal parts annoyance and respect: respect because it’s so good and we can now all heave a sigh of relief that DDL is putting cool tropical juice out for the geek crowd; and annoyance because we hardly knew it was out there and remain mostly unaware how good it is. Oh well. At least the wondering is over, the mystery solved: we know DDL can make these rums exceptional when they really try. Just don’t blink, or you’ll miss it when it comes out in your local liquor emporium. An equally quiet release seems to have been the Master Blenders Special Edition. From the July, 2017 Guyana Chronicle coverage it was a 5,000 bottle, 86 proof 10 year aged blend from Savalle, Enmore and Port Mourant stocks. Other than this coverage and an occasional store blurb it’s pretty much-crickets. It has showed up in Alberta and Quebec-or I’m just now noticing it- at about a $10 premium to the Standard 15. Nice package, a little higher proof,historic stills-I think I’ll take a flyer on it. Have you come across it? I haven’t seen it, Dwayne, but then, I haven’t gone looking for it either, though aware of its existence. I’ll probably pick up a sample or a bottle in the next few months if possible, thanks for the reminder.